The City of New York was created in the Financial District in 1624, and the neighborhood roughly overlaps with the boundaries of the New Amsterdam settlement in the late 17th century. The district comprises the offices and headquarters of many of the city's major financial institutions, including the New York Stock Exchange and the Federal Reserve Bank of New York. Anchored on Wall Street in the Financial District, New York City has been called both the most financially powerful city and the leading financial center of the world, and the New York Stock Exchange is the world's largest stock exchange by total market capitalization. Several other major exchanges have or had headquarters in the Financial District, including the New York Mercantile Exchange, NASDAQ, the New York Board of Trade, and the former American Stock Exchange. The Financial District is part of Manhattan Community District 1 and its primary ZIP Codes are 10004, 10005, 10006, and 10038. It is patrolled by the 1st Precinct of the New York City Police Department. The Financial District encompasses roughly the area south of City Hall Park in Lower Manhattan but excludes Battery Park and Battery Park City. The former World Trade Center complex was located in the neighborhood until the September 11, 2001 attacks; the neighborhood includes the successor One World Trade Center. The heart of the Financial District is often considered to be the corner of Wall Street and Broad Street, both of which are contained entirely within the district. The northeastern part of the financial district (along Fulton Street and John Street) was known in the early 20th century as the Insurance District, due to the large number of insurance companies that were either headquartered there, or maintained their New York offices there. Although the term is sometimes used as a synonym for Wall Street, the latter term is often applied metonymously to the financial markets as a whole (and is also a street in the district), whereas "the Financial District" implies an actual geographical location. The Financial District is part of Manhattan Community Board 1, which also includes five other neighborhoods (Battery Park City, Civic Center, Greenwich South, Seaport, and Tribeca). The Financial District has a number of tourist attractions such as the South Street Seaport Historic District, newly renovated Pier 17, the New York City Police Museum, and Museum of American Finance. National Museum of the American Indian, Trinity Church, St. Paul's Chapel, and the famous bull. Bowling Green is the starting point of traditional ticker-tape parades on Broadway, where here it is also known as the Canyon of Heroes. The Museum of Jewish Heritage and the Skyscraper Museum are both in adjacent Battery Park City which is also home to the Brookfield Place (formerly World Financial Center). For census purposes, the New York City government classifies the Financial District as part of a larger neighborhood tabulation area called Battery Park City-Lower Manhattan. Based on data from the 2010 United States Census, the population of Battery Park City-Lower Manhattan was 39,699, an increase of 19,611 (97.6%) from the 20,088 counted in 2000. Covering an area of 479.77 acres (194.16 ha), the neighborhood had a population density of 82.7 inhabitants per acre (52,900/sq mi; 20,400/km2). The racial makeup of the neighborhood was 65.4% (25,965) White, 3.2% (1,288) African American, 0.1% (35) Native American, 20.2% (8,016) Asian, 0.0% (17) Pacific Islander, 0.4% (153) from other races, and 3.0% (1,170) from two or more races. Hispanic or Latino of any race were 7.7% (3,055) of the population. The population of the Financial District has grown to an estimated 61,000 residents as of 2018, up from 43,000 as of 2014, which in turn was nearly double the 23,000 recorded at the 2000 Census. Financial District is located within several ZIP Codes. The largest ZIP Codes are 10004, centered around the Battery; 10005, around Wall Street; 10006, around the World Trade Center; 10007, around City Hall; and 10038, around South Street Seaport. There are also several smaller ZIP Codes spanning one block, including 10045 around the Federal Reserve Bank; 10271 around the Equitable Building; and 10279 around the Woolworth Building. Financial District and Lower Manhattan generally have a higher rate of college-educated residents than the rest of the city. The vast majority of residents age 25 and older (84%) have a college education or higher, while 4% have less than a high school education and 12% are high school graduates or have some college education. By contrast, 64% of Manhattan residents and 43% of city residents have a college education or higher. :6 The percentage of Financial District and Lower Manhattan students excelling in math rose from 61% in 2000 to 80% in 2011, and reading achievement increased from 66% to 68% during the same time period. The largest transit hub, Fulton Center, was completed in 2014 after a $1.4 billion reconstruction project necessitated by the September 11, 2001 attacks, and involves at least five different sets of platforms. This transit hub was expected to serve 300,000 daily riders as of late 2014. The World Trade Center Transportation Hub and PATH station opened in 2016. MTA Regional Bus Operations also operates several bus routes in the Financial District, namely the M15, M20, M15 SBS, M55 and M103 routes running north-south through the area, and the M9 and M22 routes running west-east through the area. There are also many MTA express bus routes running through the Financial District. The Lower Manhattan Development Corporation operates a free shuttle bus, the Downtown Connection, which circulates around the Financial District during the daytime. Ferry services are also concentrated downtown, including the Staten Island Ferry at the Whitehall Terminal, NYC Ferry at Pier 11/Wall Street (and Battery Park City Ferry Terminal starting in 2020), and service to Governors Island at the Battery Maritime Building. 1,776 (541.3) 104 2014 Is the sixth-tallest building in the world and the tallest building in the United States since its topping out on May 10, 2013. It is also the tallest building in the Western Hemisphere and the tallest all-office building in the world. 1,079 (329) 80 2018 Mixed use; opened in 2018. ^ a b c d "Wall Street/Financial District neighborhood in New York". Retrieved March 18, 2019. ^ Couzzo, Steve (April 25, 2007). "FiDi Soaring High". New York Post. Retrieved December 3, 2014. The Financial District is over. So is the “Wall Street area.” But say hello to FiDi, the coinage of major downtown landlord Kent Swig, who decided it’s time to humanize the old F.D. with an easily remembered, fun-sounding acronym. ^ "Top 8 Cities by GDP: China vs. The U.S." Business Insider, Inc. July 31, 2011. Archived from the original on February 5, 2013. Retrieved March 25, 2015. For instance, Shanghai, the largest Chinese city with the highest economic production, and a fast-growing global financial hub, is far from matching or surpassing New York, the largest city in the U.S. and the economic and financial super center of the world. ^ "NYSE Listings Directory". Archived from the original on July 19, 2008. Retrieved June 23, 2014. ^ a b Bob Pisani (May 18, 2018). "New 3 World Trade Center to mark another step in NYC's downtown revival". CNBC. Retrieved May 18, 2018. ^ a b C. J. Hughes (August 8, 2014). "The Financial District Gains Momentum". The New York Times. Retrieved August 14, 2014. ^ "Engine Company 4/Ladder Company 15/Decontamination Unit". FDNYtrucks.com. Retrieved March 14, 2019. ^ "Engine Company 6". FDNYtrucks.com. Retrieved March 14, 2019. ^ "Financial District, New York City-Manhattan, New York Zip Code Boundary Map (NY)". United States Zip Code Boundary Map (USA). Retrieved March 20, 2019. ^ "Location Details: Hanover". USPS.com. Retrieved March 7, 2019. ^ "Location Details: Peck Slip". USPS.com. Retrieved March 7, 2019. ^ "Location Details: Whitehall". USPS.com. Retrieved March 7, 2019. ^ "Financial District New York School Ratings and Reviews". Zillow. Retrieved March 17, 2019. ^ "Urban Assembly School of Business for Young Women, the". New York City Department of Education. December 19, 2018. Retrieved March 20, 2019. ^ "Spruce Street School". New York City Department of Education. December 19, 2018. Retrieved March 20, 2019. ^ "Millennium High School". New York City Department of Education. December 19, 2018. Retrieved March 20, 2019. 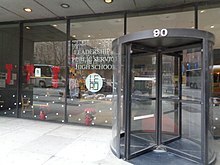 ^ "Leadership and Public Service High School". New York City Department of Education. December 19, 2018. Retrieved March 20, 2019. ^ "Manhattan Academy For Arts & Language". New York City Department of Education. December 19, 2018. Retrieved March 20, 2019. ^ "High School of Economics and Finance". New York City Department of Education. December 19, 2018. Retrieved March 20, 2019. "Brooklyn Bus Service" (PDF). Metropolitan Transportation Authority. November 2017. Retrieved April 24, 2018. "Bronx Bus Service" (PDF). Metropolitan Transportation Authority. September 2017. Retrieved April 24, 2018. "Staten Island Bus Map" (PDF). Metropolitan Transportation Authority. August 2018. Retrieved August 18, 2018. ^ "Downtown Connection Bus". www.downtownny.com. Alliance for Downtown New York. Retrieved March 11, 2018. ^ "Route Map" (PDF). NYC Ferry. 2017. Retrieved July 13, 2017. ^ "One World Trade Center". The Skyscraper Center. CTBUH. Retrieved May 14, 2013. ^ Murray, Matt; Kim, Eun Kyung (May 14, 2013). "Cheers Erupt as Spire Tops One World Trade Center". CNBC. Retrieved May 12, 2013. ^ Elizabeth Fazzare (June 11, 2018). "3 World Trade Center Is Officially Unveiled After Years of Delays". Architectural Digest. ^ "Building Overview". Retrieved September 21, 2016. ^ "American International Building". SkyscraperPage.com. Retrieved November 22, 2007. ^ "Four Seasons Hotel at 30 Park Place Will Open in July 2016". Zoe Rosenberg. Retrieved August 30, 2015. ^ "Trump Building". SkyscraperPage.com. Retrieved November 22, 2007. ^ "One Chase Manhattan Plaza". SkyscraperPage.com. Retrieved November 22, 2007. ^ "Financial District, Manhattan". CTBUH Skyscraper Center. ^ "50 West Street". SkyscraperPage.com. Retrieved February 14, 2016. ^ "Goldman Sachs Headquarters". Emporis.com. Retrieved July 21, 2012. ^ "Goldman Sachs New World Headquarters". SkyscraperPage.com. Retrieved July 21, 2012. ^ "60 Wall Street". Emporis.com. Retrieved November 19, 2007. ^ "60 Wall Street". SkyscraperPage.com. Retrieved November 22, 2007. ^ "One Liberty Plaza". Emporis.com. Retrieved November 19, 2007. ^ "1 Liberty Plaza". SkyscraperPage.com. Retrieved November 22, 2007. ^ "20 Exchange Place". Emporis.com. Retrieved November 19, 2007. ^ "20 Exchange Place". SkyscraperPage.com. Retrieved November 22, 2007. ^ "Three World Financial Center". Emporis.com. Retrieved November 19, 2007. ^ "Three World Financial Center". SkyscraperPage.com. Retrieved November 22, 2007. ^ "HSBC Bank Building". Emporis.com. Retrieved November 19, 2007. ^ "HSBC Bank Building". SkyscraperPage.com. Retrieved November 22, 2007. ^ "55 Water Street". Emporis.com. Retrieved November 19, 2007. ^ "55 Water Street". SkyscraperPage.com. Retrieved November 22, 2007. ^ "Bank of New York Building". Emporis.com. Retrieved November 19, 2007. ^ "Bank of New York Building". SkyscraperPage.com. Retrieved November 22, 2007. ^ "Two World Financial Center". Emporis.com. Retrieved November 19, 2007. ^ "Two World Financial Center". SkyscraperPage.com. Retrieved November 22, 2007. ^ "One New York Plaza". Emporis.com. Retrieved November 19, 2007. ^ "One New York Plaza". SkyscraperPage.com. Retrieved November 22, 2007. ^ "Home Insurance Plaza". Emporis.com. Retrieved November 19, 2007. ^ "Home Insurance Plaza". SkyscraperPage.com. Retrieved November 22, 2007. 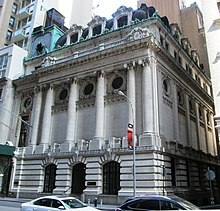 Wikimedia Commons has media related to Financial District, Manhattan.